The entire Elephant is worked in s c.
Ch 14 for front leg, work 13 s c on ch and work 8 more rows even. 10th Row. Increase 1 st at end of row and work 1 row even. Repeat the last 2 rows. 14th Row. Repeat 10th row and work 3 rows even. 18th Row. 1 s c in each s c, ch 30, turn and work 29 s c on ch and 1 s c in each s c.
20th Row. Increase 1 st at end of row and work 3 rows even. 24th Row. Increase 1 st at end of row. 25th Row. 1 s c in each of the first 15 s c, turn and work 5 rows on 15 s c even. 31st Row. Decrease 1 st at beginning of row and work 1 row even. Repeat the last 2 rows 4 times. 41st Row. Decrease 1 st at beginning of row. 42nd Row. Decrease 1 st at end of row. Repeat the last 2 rows, break yarn, and work another section. HIND LEG. Join yarn in 1st s c and work 1 s c in 1st 14 s c, 2 s c in next s c, ch 1, turn and work 2 rows even. 4th Row. Decrease 1 st at beginning of row and work 1 row even. Repeat the last 2 rows. 8th Row. Decrease 1 st at beginning of row and work 10 rows even, break yarn and work another section. HEAD. Join yarn in 1st s c in front leg and work 1 s c in each of the 1st 8 s c, ch 1, turn. 2nd Row. 1 s c in each s c, ch 20, turn. 3rd Row. 19 s c on ch, 1 s c in each s c and work 9 rows even. 13th Row. Decrease 1 st at beginning of row and work 1 row even. Repeat the last 2 rows 5 times. 25th Row. Decrease 1 st at beginning of row. 26th to 31st Row. Decrease 1 st at the beginning and end of each row, break yarn. TRUNK. Join wool in 1st s c at lower part of head and work 1 s c in each of the 1st 14 s c, ch 1, turn. 2nd Row. 1 s c in each s c.
3rd Row. Decrease 1 st at the beginning of row and work 1 row even. Repeat the last 2 rows 5 times. 15th to 18th Row. Decrease 1 st at beginning of row. 19th, 21st, 23rd Rows. Increase 1 st at beginning of row. 20th, 22nd & 24th Rows. Decrease 1 st at beginning of row and work 1 row even. 26th Row. Decrease 1 st at the beginning of row and work 4 rows even. Work 1 row of s c across front of trunk, working 1 s c in every other row. This shapes the trunk, break yarn and work other half to correspond. SADDLE. Join Scarlet in 1st free s c next to head, turn, sl st into 1st row of head, turn, s c in st with joining, 1 s c in each s c across back, sl st into side of next row, turn, s c in each s c, sl st into side of work and continue working back and forth, working 2 rows of s c in Scarlet for each row of White until all rows of White have been worked up, break yarn and repeat for other side. Work 2 sections following the first 23 rows given and work hind leg following directions given for hind leg. FEET. Ch 2, 7 s c in first ch. 2nd & 3rd Rows. 2 s c in each s c and work 1 row even, break yarn and work 3 more feet. EAR. Ch 21, 20 s c on ch. 2nd to 7th Rows. Increase at the beginning of row. 8th Row. Increase at end of row. 9th Row. 1 s c in each of the 1st 9 s c, sl st in each of the next 3 s c, ch 1, turn. 10th Row. Sl st in each sl st and s c in each s c.
11th Row. 1 s c in each s c, 1 s c in each sl st, then sl st over next 3 sts, ch 1, turn. 12th Row. Sl st in each sl st and s c in each s c.
13th Row. Same as 11th Row. 14th Row. Same as 12th Row. 15th Row. 1 s c in each st across entire row. 16th Row. Increase at end of row and work a row of s c across long side of ear, break yarn and work other ear to correspond. TAIL. Ch 6, join, ch 1 and work 1 s c in each st, continue work until tail measures 3 ? inches, then draw up loop on hook about 1 ? inches long, * 1 s c in next s c, draw up a loop, repeat from * all around. Break yarn and trim edge. TUSKS. Ch 4, join, work same as tail until work measures 3 inches, break yarn, leaving 8 inch end, thread needle and drawn yarn through tusk and back again, drawing it up slightly to shape. Sew sections together, leaving an opening at the bottom for filling. Set in the section for feet, fill and sew up. Attach ears, tail and tusks. Embroider the eyes in Tan with Brown French Knot in the center. 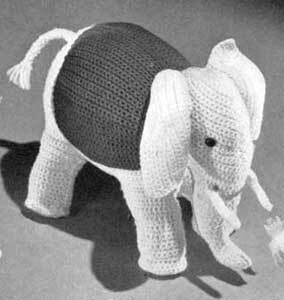 The elephant may also be made in "Dawn" Knitting Worsted.